I had a great time reading "The Big Year". It is an easy and quick read filled with great personalities, fast-paced adventure, rivalry, comedy, drama, failed romance, triumphant romance, enduring romance, rarity chasing, practical jokes, and the quirks of birding that we birders all love. Mark Obmascik has a a very readable writing style (Mitch Albom-like but without too much of the mushy emotional stuff) that would make this book enjoyable for even non-birders. I can totally see why some folks in Hollywood are looking at making a movie out of this book. Obmascik paints a great picture of each of the characters. I always love a book or TV show that captures unique and quirky personalities that you love and love to hate. How true to reality his portraits of Sandy Komito, Al Levantin, and Greg Miller are?...who cares! It was just a fun read. There seems to be a growing movement in the birding world to reject competitive birding and to treat it as an immoral practice. For one to even think of keeping a life list or to have such goals as seeing 700 birds in one's lifetime is sinful and damned be their soul! The new philosophy of elitist birding is that we should simply "observe birds because they are". I get it, but I feel the competition still has its place in the arena of birding and birdwatching. I've yet to meet a competitive birder that didn't love and enjoy each bird he or she has seen. Listing motivates many to get out and find new birds in new places. Often the birding elitists parasite off these sightings, go to the reported places to enjoy the birds, while smugly decrying the evils of the listers who provided the location. Others espouse their enlightened perspective of "let the birds come to you" and are content to enjoy their backyard birds by manipulating them with hundreds of dollars worth of wild bird seed, yet they are first in line to reprimand the guy who pishes his way to a new life bird. I say, judge not, lest ye be judged. I claim the privilege of birding according to the dictates of my own conscience, and allow all other birders the same privilege, let them bird how, where, or what they may as long as they don't endanger the bird. 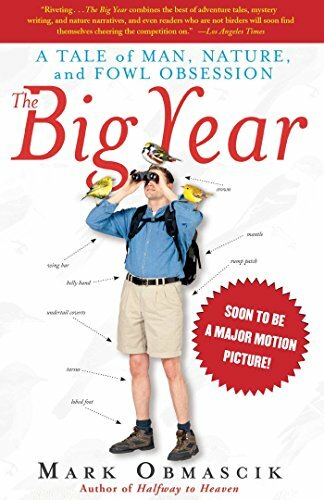 Just enjoy birds and birding like I enjoyed reading "The Big Year"! Avimor, an excellent book review. I read this when it first came out and I had no idea I would one day (almost) be one of them! I had no idea anyone listed birds or competed to list birds! I agree that this is a fun book to read whether you are a birder or not just because of the quirkiness of it all. As for the listing thing, I agree with you also. Though I am not a competitive lister, per se, I have become obsessive about listing birds for my own pleasure and for helping eBird. Listing helped get me outside my own yard and into the wild areas around me. It also got me to volunteer for the Tucson Audubon IBA survey and quickly became part of my blog. Thank you for this excellent post! Thanks for the review. I thought that I had read this one but it was a book called To see every Bird On Earth or Featherquest I was thinking of.I will pick this one up. I very much enjoyed the book when I read it when it first came out. I still have the book and will read it again. Thanks for inspiring me.